ICH Blog: North River dancers take over the Ship Pub in St. John's! North River dancers take over the Ship Pub in St. John's! In 1992, Sheila Power of North River organized a St. Patrick’s Day family concert, with the hope it would become a yearly occurrence for All Hallow’s Parish. Thinking that the traditional Lancers would add to the concert, she went searching for local dancers who would show off their talents. The dancing was a great hit, and the group continued performing the Lancers for local concerts. Since 2009, the group has been meeting regularly and working on dances, under the guidance and direction of Power, with live music provided by accordionist Web Dawe. In the summer of 2010, the Baccalieu Trotters were one of the groups that took part in a traditional Newfoundland folkdance symposium in Old Perlican, as part of the Cupids 400 celebrations. 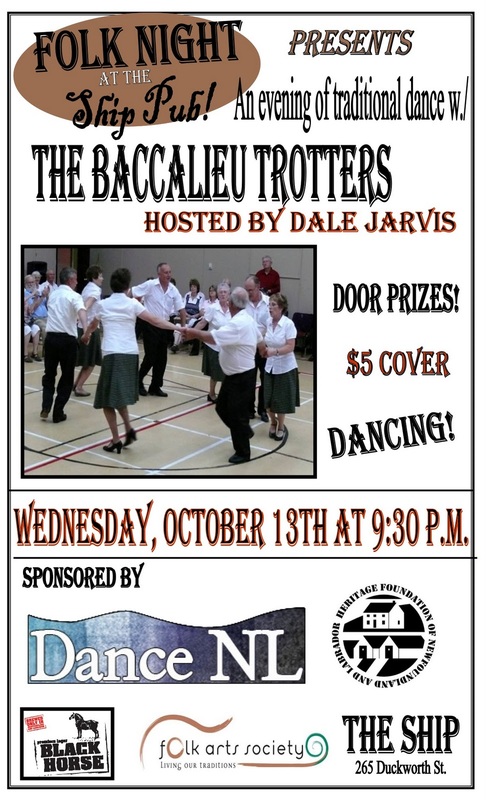 The Baccalieu Trotters will be the featured performers at the Folk Arts Society’s weekly Folk Night at The Ship Pub on Solomon’s Lane in St. John’s on Wednesday, October 13th. The event starts at 9:30pm, and is $5 at the door. 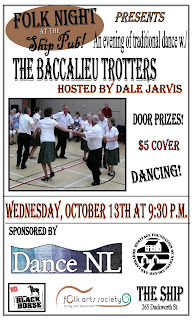 Hosted by Dale Jarvis, and co-sponsored by Dance NL.